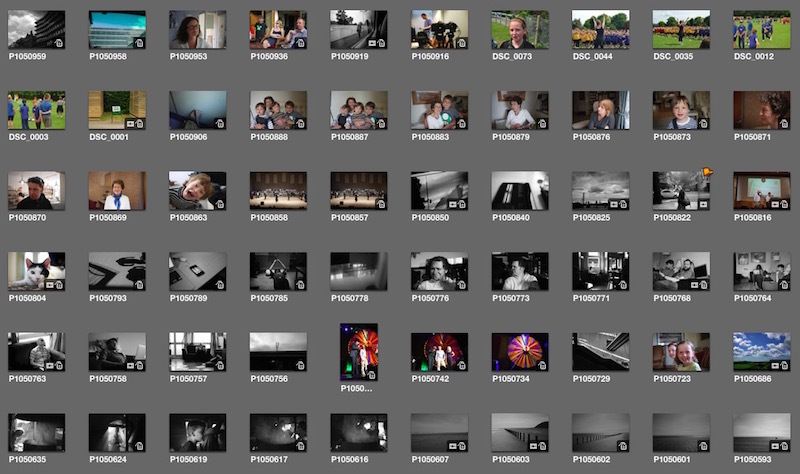 Reading reviews of Apple's new Photos app, a thought struck me: people have so many photos. I have so many photos. Too many. Keeping all of them is daft. I don't need all seven photos I took of Uncle Jack at the family reunion. I just need the best one. I don't need 12 photos I took of B on his last day at primary school. I just need the best one. I don't need to keep the dozens of photos I took of one of K's knitting projects, just so she could use the best one on Ravelry. I don't need to keep all those iOS screenshots. I don't need to keep any photo that, frankly, isn't very interesting or very good. During a recent visit to my mum's house in Kent, I noticed the old family photos she has in frames and on the walls. I flicked through an envelope of them. There are very, very few. A handful of each person. They're the reason people talk about "treasured memories", because each image is so precious, so priceless, so irreplaceable. Over the last couple of evenings, I've been weeding my photo library. I do it a year at a time, deleting everything except the images I really think are worth hanging on to. I've been ruthless about it: I started with over 3000 photos taken during 2014 - now culled down to 758. The same for 2013's photos - just under 3000, reduced to 751. Yes, it takes a while, but I feel better for having done it. Another thing I'm doing is making photo books, one per year. I used to do this every Christmas, when B was small, but I fell out of the habit. Now I'm catching up, making a book of the very best 30 or so photos from each year. I like having them as an object on the shelf, something I can pick up and show people. I like to think that they're something that can last a long time, perhaps longer than me. Like my stepfather's personal papers, they can be a record that lasts, a record that matters.